1) This short book packs a simple and direct message: Open-Door leaders offer challenges which will help others grow. This is a powerful message and Bill uses economy of force to convey that message quickly, appropriately, and with style. Based on his own solid leadership experience, including a few very negative moments, Bill describes effective and proactive leadership which we should all aspire toward. … and nary a word about increasing shareholder value, managing corporate processes and structures, or the term “human resources”. 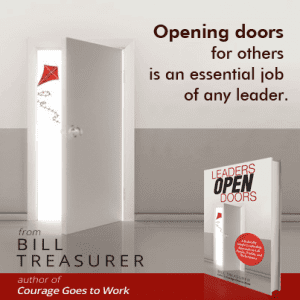 Bill uses the term “Open-Door Leadership” in a way far different from what most of us have experienced. Instead of the traditional false openness of “My door is always open to you”, the real Open-Door Leader is walking out that door and looking for opportunities to help others. 2) Useful and thoughtful statements, which repeatedly made me stop and think “Well, of course!” . I admire writing where the opportunity to high-light, reflect, and learn comes often. Bill has a knack for saying things with passion and conviction, which gets my attention and provides ample chances to think in a new way about things I have done for years. Bill’s engaging and direct writing style makes reading Leaders Open Doors a highly enjoyable experience. 3) The proceeds from sales of Leaders Open Doors go to charities serving children with special needs. This touches my heart, since I share Bill’s interest in this cause. When you can help this very special population while learning valuable lessons about effective leadership, I cannot imagine why you would not just do it. It’s the perfect “Twofer”. Every month, many new books on various aspects of leadership development appear and many have value in some fashion. Very few are worth reading again and again and again. Leaders Open Doors is one of those few. Enjoying the heck out of this little book in the Heartland …. Disclaimer: Yes, I received a copy of this book for review. As always, my comments represent my honest and unbiased assessment of the book’s value for others. I will recommend and sometimes gift this book to those interested in becoming better leaders. Bill Treasurer, Chief Encouragement Officer at Giant Leap Consulting and former U. S. High Diver, wants leaders to be a part of opening doors of opportunities for others to thrive, achieve, and lead. The proceeds of his new book, Leaders Open Doors, are being donated to charities that serve children with special needs. Available on Amazon. This entry was posted in Attitude, Authority, Behavior, Books, Career Development, Coaching, Competencies, Effectiveness, Leadership, Management, Performance, Reflection, Relationships, Work by John E. Smith. Bookmark the permalink.